Frank attended Evanston Township High School in Evanston, Illinois, where he obtained notoriety as a superb football player. He then attended Lawrenceville (N.J.) School. Frank attended Yale College, where he was a member of Skull and Bones, and graduated with a degree in economics in 1938. In football, he was a two-time team captain and All-American, and as a senior in 1937, he won the Heisman Trophy and the Maxwell Award. He beat out Byron "Whizzer" White for the Heisman Trophy; White later became a justice on the U.S. Supreme Court. Frank also received the Maxwell Award after his senior year in which he scored three touchdowns in his team`s 19-0 victory over Brown. Frank was married to Margaret Rathje Frank, with whom he had three sons and six daughters. Clint Frank attained the rank of Lieutenant Colonel in the Army Air Corps, serving as an aide to General Jimmy Doolittle during World War II. Following the war he resumed his career in advertising. Frank joined the Chicago advertising firm of Blackett-Sample-Hummert Inc., where he was employed for ten years before being promoted to advertising manager of E.J. Brach and Sons, the famed candy producer. Frank became a full partner in the advertising agency of Price, Robinson and Frank. He was able to transition this agency into his own with him as owner and president. In 1954 Frank established Clinton E. Frank Inc., a Chicago based advertising agency which was sold to Campbell-Ewald Co. of Detroit in 1976. One of Clinton E. Frank Agency's most memorable clients was the flashy Dallas-based Braniff International Airways. Frank obtained the account in 1969 from famed advertising executive George Lois. The Frank Agency created the "El Clan, Braniff" advertising scheme for Braniff's growing South American Route System. They also created the highly unique Braniff "You'll Like Flying Braniff Style" Campaign. Both campaign's came complete with musical jingles which were debuted in 1971. Frank founded the Brain Research Foundation at the University of Chicago and the Eye Research Institute in Boston. He also founded the American Academy of Arts during his retirement. Frank died at the Evanston Hospital in Evanston, Illinois after a brief illness. ↑ Wallace, William N. (2005). 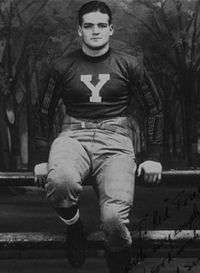 Yale's Ironmen: A Story of Football & Lives in the Decade of the Depresion & Beyond. p. 157. 1 2 3 Nidetz, Steve (July 8, 1992). "Clinton Frank, Ad Exec, Football Star". Chicago Tribune. Retrieved 26 July 2013. ↑ "Jingle: Braniff "You'll Like Flying Braniff Style"". Fly The Branded Skies. www.brandedskies.com. Retrieved 25 July 2013.